At least 42 people were killed in a street battle between supporters and opponents of Russia in southern Ukraine that ended with dozens of pro-Russian protesters incinerated in a burning building, bringing the country closer to war. Pro-Russian rebels in the east freed seven European military observers on Saturday after holding them hostage for eight days, while Kyiv pressed on with its biggest military operation so far to reclaim rebel-held territory in the area. The riot in the Black Sea port of Odesa, ending in a deadly blaze in a besieged trade union building, was by far the worst incident in Ukraine since a February uprising that ended with a pro-Russian president fleeing the country. 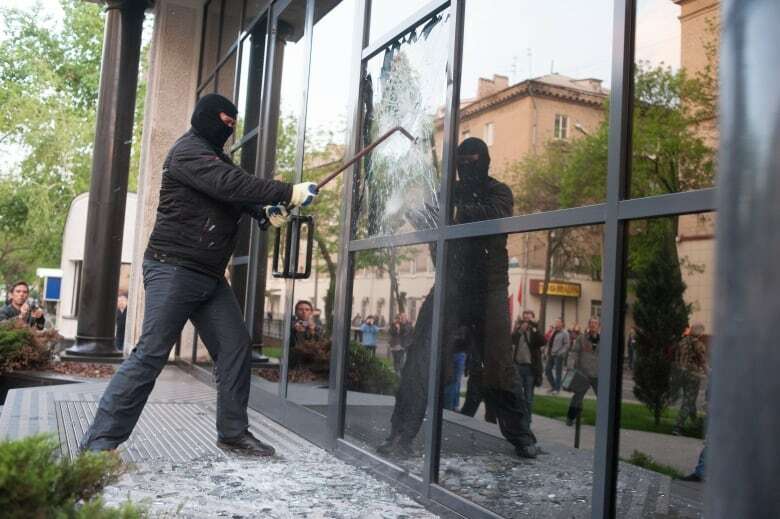 A couple of hundred pro-Russian protesters in the eastern city of Donetsk stormed the governor's business premises and the state security headquarters, ransacking files and smashing windows. The attack reflected growing disorder in the area, targeting as it did a security building that had already been brought under rebel control. "This is for yesterday!" said Tatiana Kamniva outside the governor's office. "They're monsters, worse than monsters." The Odesa clashes spread the violence from the eastern separatist heartland to an area far from the Russian frontier, raising the prospect of unrest sweeping more broadly across a country of around 45 million people the size of France. The Kremlin, which has massed tens of thousands of soldiers on Ukraine's eastern border and proclaims the right to invade to protect Russian speakers, said the government in Kyiv and its Western backers were responsible for the deaths. Kyiv said the violence was provoked by foreign demonstrators sent in from Transdniestria, a nearby breakaway pro-Russian region of Moldova where Moscow has a military garrison. It said most of the dead who had been identified so far were from there. 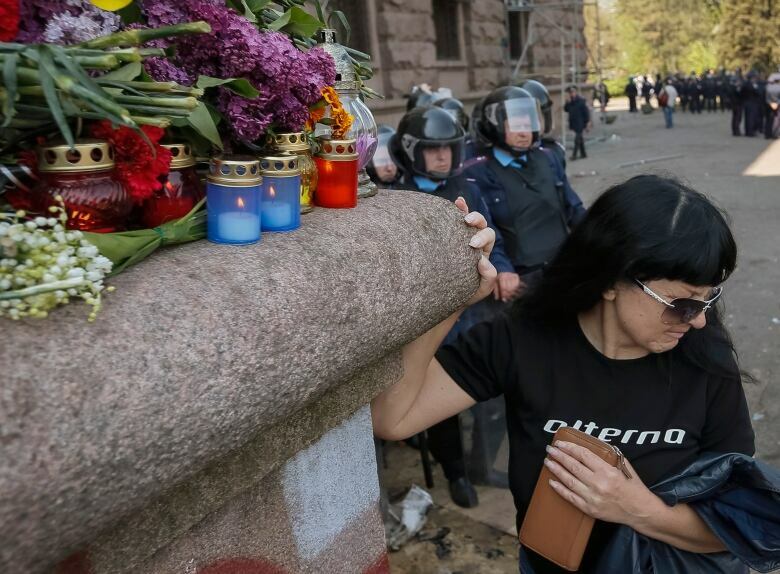 On Saturday morning, people placed flowers near the burnt-out doors of the trade union building, lighting candles and putting up the yellow, white and red flag of the city. About 2,000 pro-Russian protesters outside the burnt-out building chanted "Odesa is a Russian city." 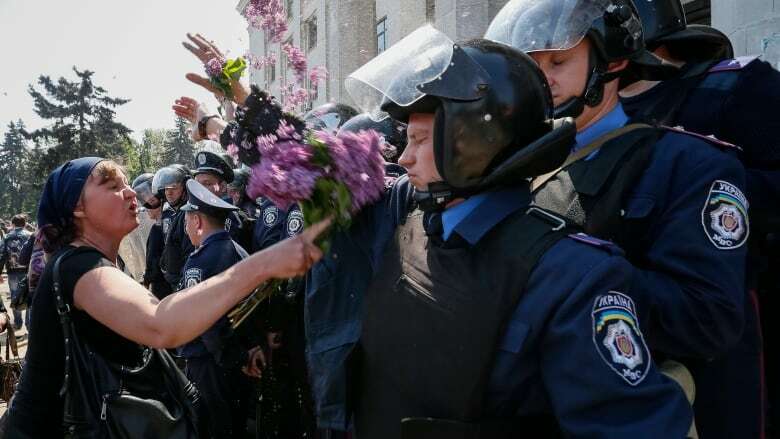 Events took a violent turn on Friday when a column of soccer supporters, chanting support for Ukraine's leaders, clashed with men in black, some firing pistols. Television pictures showed police caught between the two sides. Clashes then spread along the streets until rebels moved into a large trade union building. Petrol bombs were thrown and shots were heard though the exact sequence and detail of events remained unclear on Saturday. Oleg Konstantinov, a journalist covering the events for a local Internet site, said bullets had flown in the melee before the blaze: "I was hit in the arm, then I started crawling, and then got hit in the back and leg." The Odesa bloodshed came on the same day that Kyiv launched its biggest push yet to reassert its control over separatist areas in the east, hundreds of kilometres away, where armed pro-Russian rebels have proclaimed a "People's Republic of Donetsk". The rebels there aim to hold a referendum on May 11 on secession from Ukraine, similar to one staged in March in Ukraine's Crimea region, which was seized and annexed by Russia in a move that overturned the post-Cold War diplomatic order. On Saturday the government said it was pressing on with the offensive in the area for a second day, and had recaptured a television tower and a security services building from rebels in Kramatorsk, a town near the rebel stronghold of Slovyansk. Health authorities said six people were killed in fighting. "We are not stopping," Interior Minister Arsen Avakov said in a post on Facebook. The Donetsk region administration said snipers were shooting from rooftops in Kramatorsk, shops were closing and there was an atmosphere of panic. A Reuters correspondent reported in late afternoon, however, that the town was quiet. Vasyl Krutov, head of a government "anti-terrorist centre" behind the operation in the east, told a news conference: "What we are facing in the Donetsk region and in the eastern regions is not just some kind of short-lived uprising, it is in fact a war." The military operation in the east was overshadowed by the unprecedented violence in Odesa, a vibrant multi-ethnic port city that has seen some support for separatists but nothing like the riots that erupted on Friday. Police said four people were killed, at least three shot dead, and dozens wounded in running battles between people backing Kyiv and pro-Russian activists. The clashes ended with separatists holed up in the trade union building. At least 37 people died in the blaze. On Saturday, police raised the death toll in the city to 42, easily the biggest toll since about 100 people were killed in Kyiv protests that toppled pro-Russian President Viktor Yanukovich in February. "Kyiv and its Western sponsors are practically provoking the bloodshed and bear direct responsibility for it," RIA Novosti quoted Kremlin spokesman Dmitry Peskov as telling reporters. Kyiv's Interior Ministry blamed the pro-Russian protesters, saying they had attacked the pro-Ukrainians before retreating to the trade union headquarters, from where they opened fire on the crowd and threw out the petrol bombs that caused the blaze. Odesa is located in the southwest of Ukraine, far from the eastern areas held by the rebels and far from the Russian frontier where Moscow has amassed forces. But it is close to Moldova's Transdniestria region, where Russia also has troops. The spread of violence to Odesa expands the zone of unrest across the breadth of southern and eastern Ukraine. "Today we Ukrainians are constantly being pushed into confrontation, into civil conflict, toward the destruction of our country to its heart. We cannot allow this to happen," said acting President Oleksander Turchinov. Regional police chief Petro Lutsiuk said on Saturday more than 130 people had been detained and could face charges ranging from participating in riots to premeditated murder. The release of the military monitors from the Organization for Security and Cooperation in Europe resolves a major diplomatic issue for the West. Moscow said the release showed the "bravery and humanism" of the rebels defending Slovyansk. Western officials, including U.S. Secretary of State John Kerry and Germany's Foreign Minister Frank-Walter Steinmeier, welcomed the release but said Russia should still do more to help de-escalate the crisis. Kerry spoke to Russian Foreign Mininster Sergei Lavrov by telephone. Both sides said they agreed that the OSCE should play a bigger role in helping to reduce tension. The separatists had captured the monitor team on April 25 and described them as prisoners of war. One Swede was freed earlier on health grounds while four Germans, a Czech, a Dane and a Pole were still being held until Saturday. The separatist leader in Slovyansk, self-proclaimed "people's mayor" Vyacheslav Ponomaryov, said they were freed along with five Ukrainian captives, with no conditions. "As I promised them, we celebrated my birthday yesterday and they left. As I said, they were my guests." The OSCE team's leader, German Colonel Axel Schneider, speaking on the road out of Slovyansk after being freed, said: "You can imagine, it's a big relief. The situation was really tough. The last two nights when you see what was going on, every minute gets longer." He praised his captor Ponomaryov as "a man whose word counts a lot. He's a man who listens". Western countries accuse Russia of stoking the separatism and fear Moscow could be planning to repeat its annexation of Crimea in other parts of Ukraine. Russia denies it has such plans, while saying it could intervene if necessary to protect Russian speakers, a new doctrine unveiled by President Vladimir Putin in March that overturned decades of post-Soviet diplomacy. The West has made clear it will not use military force to protect Ukraine but will rely on economic sanctions against Moscow to, in the words of U.S. President Barack Obama, change Putin's "calculus". If NATO calls, will Canada stand by Ukraine? Ukraine crisis: Can a weakened NATO stand up to Putin?